The mighty magician Veznan is back! Embark on an epic journey and help him build an army of darkness and realize his cunning plan ... ha ha ha! Show the Kingdom who is the real boss here! Fight and conquer both new and already familiar land. 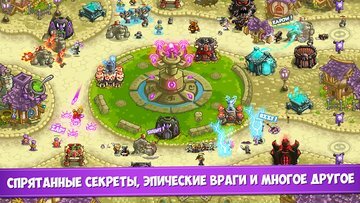 Face powerful empires and clash with powerful bosses in this classic tower defense game full of humor and epic swing! 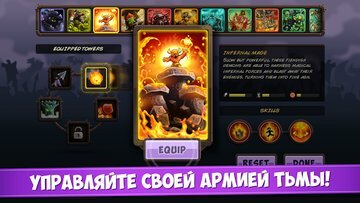 Features - 16 new towers, each of which has unique abilities and special skills. - Choose your arsenal of towers and collect destructive combinations to stop your enemies! - 16 challenging stages unfolding in the middle of three lands that are waiting for their new owner! - 9 powerful heroes who fulfill your orders without hesitation. - More than 35 dangerous enemies that make you pretty sweat. 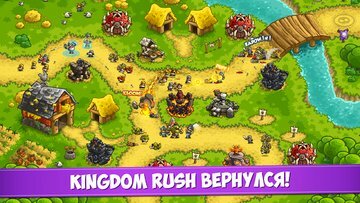 - Sweep the storm over the Kingdom and destroy 3 powerful kings. There will be legends about you! 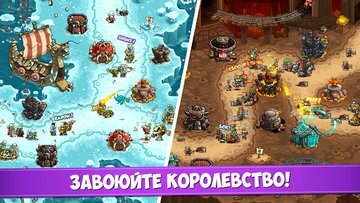 - New skills and reinforcements that will help you to destroy your enemies. 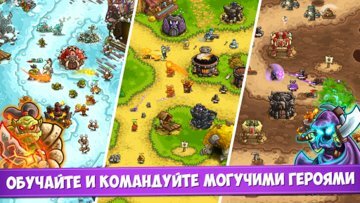 - More than 10 trinkets and artifacts will increase your chances on the battlefield. - 30 improvements to bring your army in the best possible form. - Over 50 achievements, hidden secrets and various easter eggs that are very fun to look for! “Have you had WiFi in your Dark Tower yet?” Nothing wrong! You can play without it!